KANSAS CITY, MO--(Marketwired - April 15, 2015) - As Apple announces its new offering, PEQ, a modern home security and automation service, is jumping on board. The company is gearing up to release the next version of its app, updated to support the Apple Watch. Users will be able to access and control their PEQ systems from the wrist. "PEQ on the Apple Watch provides our users with another beautiful and intelligent way to interact with their home," said Steve Bosch, VP of Product & Strategy for PEQ. "A simple tap on the wrist is often a more natural way to control devices in your home, especially when your phone isn't easily accessible. We're excited about what the Apple Watch will allow us to offer our customers." This is the first wearable device integrated into the PEQ device ecosystem, which speaks to the company's dedication to providing consumers with a user experience that is convenient and easy. The updated PEQ app is set to release in May, shortly after the Apple Watch. 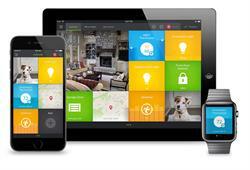 Control and monitor your home with the Apple Watch. Control and monitor your home from the Apple Watch.